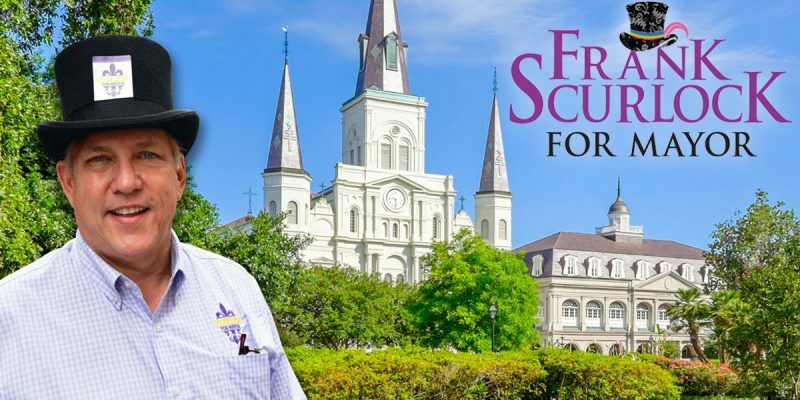 Frank Scurlock, New Orleans businessman and candidate for mayor, announced on Saturday that he has injected $500,000 of his personal wealth into his campaign war chest. Scurlock’s family invented inflatable jump houses, an industry that has blossomed into a multi-million dollar one over the past few decades. He has told some he is willing to spend $3,000,000 in his bid to become mayor. Scurlock will be the conservative Democrat in a New Orleans Mayor’s race that is wide open. Municipal Court Judge Desiree Charbonnet is seen as the de facto front runner right now. Sources close to her campaign suggest she will post a nice fundraising number for the second quarter. With Congressman Cedric Richmond helping from behind the scenes, many expect that figure to be just north of $750,000 cash-on-hand. On the other hand, City Councilwoman LaToya Cantrell and Judge Michael Bagneris are both said to be having trouble raising the funds necessary to compete. A poll released by Charbonnet has the race a virtual dead heat between the municipal court judge and Cantrell, with 22 for Charbonnet and 21 for Cantrell. Some 39 percent were undecided. With heavyweights such as Senators J.P. Morrell and Karen Carter Peterson passing on the race, and popular State Representative Walt Leger likely doing the same, the field is less than exciting. If the field is in fact set at four, Scurlock and Charbonnet may be the only ones with the funds to compete – which may or may not matter, since New Orleans whites usually align with the friendliest black candidate. The number one issue in New Orleans right now is crime. The question will be whether voters in Orleans Parish will see Judge Charbonnet, or Councilwoman Cantrell, as a big enough departure from the policies of Mitch Landrieu. Frank Scurlock offers that sort of dynamic change in a political climate where “establishment” politicians and incumbents are almost at a disadvantage. Scurlock is also an outspoken critic on the removal of Civil War monuments. He was even arrested at the Jefferson Davis monument removal for crossing a police barricade – a clever political stunt, no doubt, that will play well for conservatives and traditional Louisiana Democrats in the Crescent City. The question is, will there be enough of those to build a coalition to win? The safe bet is on Cantrell finding a way to force a runoff with Charbonnet. Yet if Scurlock spends a potential 7-figures on the race, stranger things have happened.